When it comes to fashion trends pumpkin and peanut butter is in. Forget socks and sandals, bikes and helmets, or ketchup and everything – they’re out of style. These two orange-colored, fiber-filled, single-ingredient superfoods are the wave of the future. Give one of these tasty-cakes to the bouncer at any club in Manhattan and you’re guaranteed a spot in the VIP section. I had one of these pancakes this morning and I feel like a winner. Looking for some more ways to get your pumpkin and peanut butter fix? Try some Pumpkin Pie Ice Cream or Pumpkin Peanut Butter Oatmeal. 1. Add all ingredients to blender (except the banana, peanut butter and milk) along with 2 tsp maple syrup and process until extra smooth. Pour into a bowl. Stir in milk as needed to thin out, but this shouldn’t be needed until the batter has been refrigerated. 2. Preheat a skillet over medium heat. Once heated, spray the skillet with cooking spray and drop batter into the pan, about 1/4 cup per pancake, or make plate-sized pancakes for an added treat. Place 3 slices of banana into the top of each pancake (or 6 slices in a giant one). Once they begin to set (~ 2 minutes), flip over and cook for an additional 1-2 minutes. 3. 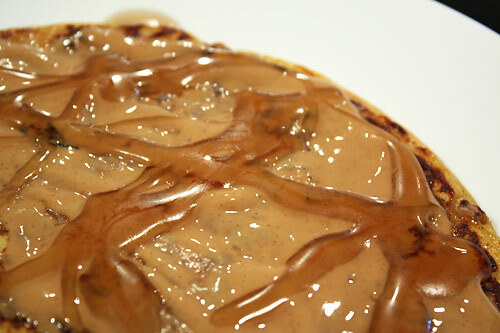 Top with peanut butter (I recommend Cinnamon Currant Peanut Butter) or butter and drizzle with maple syrup. All 3 of those pancakes look fantastic! YUM! You’re killing me. These look fantastic! Mmm looks so good. I love your banana pancakes so I will have to try these for sure! Oh man, those pancakes look insanely tempting. Yum!! Those are some nice pancakes. Love the new look and I am drooling over these pancakes! Nick, these pancakes really look amazing and so seasonal! A definite dinner for one night next week.I’ll let you know how we like them but I think I already know. I was thinking maybe a topping of sauteed cinnamon apples? Good, I’m on the eveyone else! Do you know what I was thinking? A pumpkin pie pancaque, topped with pumpkin pie oatmeal and a big scoop of pumpkin pie ice-cream. What do you think? Krista, They were all fantastic but cinnamon raisin peanut butter reigned supreme! Jessie, Thanks! Loads faster too? Excellent! Sagan, If you’re a fan of the former then you’ll be a fan of these. Veggiegirl, I suppose that explains it, I’m just amazed you have time for anything else! Juliet, I hope I live to see the day technology reaches that stage. Megan, Thanks, glad you enjoy! Mom, Ooh, great idea mom. I’ll give that a try. Clumbsycookie, Haha, I love that idea! Perhaps the oatmeal could be swirled into the batter even….Topped with ice cream, what a treat! Peanut butter and pumpkin is an excellent combination. I just made some cookies that prove it. So, what are your feelings on other nut butters? I’m asking because mixing pumpkin with almond butter and spreading it on things is fun and delicious. oh, these look great! so many uses for pumpkin! i’m sure they’re delicious!!! That looks like an awesome breakfast! I’ve given you an award, check it out! Hey there Nick, I love your PB breakfasts. Compile the lot and you’ll have a very nice cookbook – I’ll accept a dedication for the brilliant idea ;) In fact, I may have a recipe for you soon. I haven’t tried using skimmed milk for the ricotta, but I don’t see why it wouldn’t work; I gather the lemon juice reacts with the milk proteins to produce the curds. If you do try it with skimmed milk, I’d love to know how it turns out. I love your website. I adore PB although I don’t eat it that often because of the calories. I also LOVE pumpkin!!!! OMG your recipes look amazing, they made my day.. thanks for taking the time to do this! HangryPants, It truly is an excellent combination, one that most people never think to try. I’m not a huge fan of other nut butters to be honest. I love almonds but dislike almond butter. I high dislike cashews so I’m not sure if I even want to try cashew butter. I haven’t tried pecan or walnut butter mostly because of the expense but I like the crunch of regular nuts, it’s more satisfying somehow… But for use in recipes or mixed with other things I’m sure other nut butters are outstanding. Sarah, Thanks! That’s funny, this will be the third time I’m receiving that award! Dee, I would live to create a cookbook someday. I think I’ll need a few more recipes for an entire cookbook but that’s one of my dreams/goals. I gotta try making ricotta, it’s one of my fav cheeses. Leslie, Don’t worry about the calories in peanut butter, they’re all healthy calories. The high fat in peanut butter is good fat and will actually help you lose weight and stay trim on an otherwise lowfat diet. Glad you enjoy the recipes! Interesting. I think if I had to pick, I like PB better, too. AB is interesting to bake or cook with because it’s much more subtle than PB. looks fun, as always… so creative. I’ll take 2 of each, I’ll have no problem eaitng all that. These are really similar to ones I make except I leave out the oats. Yum! those look amazing. can’t wait to try ’em! my my looks like i missed a few posts… must update google reader. Another winner! I put pb-choc chips in my pumpkin cookies this weekend and they rocked!! Can you whip me up some of those for lunch, please? PLEEEEEEEEEEEEAAAAAASE? We are in a buckwheat pancake phase right now…pancakes for dinner, yum! Oh wow, these look so tasty!! These look soooo good!! I cannot wait to try them. I just found your site through KERF and an so happy I did – I looooove PB!! HangryPants, Glad you agree with me on this! Bren, Mail order pancakes, talk about decadence. Dawn, I’d like to see it! When I polish that plate off for breakfast I’m STUFFED. These are some filling pancakes. Carol, They hold together well without the oats? No flour? ttfn300, I changed hosting and switched from Blogger to WordPress so everything has shifted! Hope you got it all fixed and working again, I think I’m losing a lot of readers because of this move! Michelle Ann, Buckwheat pancakes are delicious too and any pancakes are good for dinner. There is nothing better or more exciting than brinner! Catherine, Excellent! Great to see another PB fanatic on board! Oh, how did I miss this when it came out? That’s a couple weeks now I could have been eating these things. And there’s pumpkin pie ice cream too!? I don’t like your attitude! Charlie’s a nice guy! Those look absolutely divine. I wish I were waking up to them right now… haha unfortunately not :[ Waa! You tease me so.. So over here in aus it is so hard to find good peanut butter! seeing as the US is the king of all things spreadable. perhaps we should start an exchange, supplying aussie’s with bloody good peanut butter. surly theres an easy way? help? I applaud your persistance Jessica! But all they had was Jif?? That’s too bad. I mean Jif is fine….but…. I used sweet potato instead. Very good, thanks for the recipe. You substituted an equal amount? Good pancake texture? Tasty? I used two medium sized sweet potatoes, it was thicker and softer inside and yes, very tasty! I just love Pumpkin Pie Pancakes! It tastes so delicious! Thanks for the shar!! We all loved these pancakes – even my husband who doesn’t eat pancakes. I served them with maple syrup and Greek yoghurt. delicious. Next time I make then I will take a photo. Greek yogurt on top or on the side? Glad you enjoyed it! I’d love to see what yours look like next time! I put pb-choc chips in my pumpkin cookies this weekend and they rocked!! Wonderful texture! Nice and ‘creamy’…very easy to make, too! although these are delicious the way they are, they’re ot as sweet as other recipes – which is fine, because the syrup MORE than makes up for it! EXCELLENT RECIPE!